What Parking Lot Repair services do you perform? 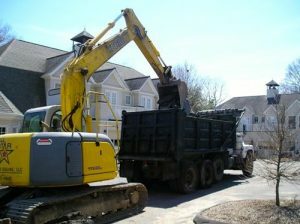 At All Star we do Parking Lot Repair and everything from original parking lot installation including clearing, drainage and infrastructure to the patching of a hole in a parking lot. We are equipped to handle any sized project and we work with our clients on a personal level to provide them the services they need. Our services include asphalt paving, drainage, patching, seal coating, crack repair, striping, concrete curbing and sidewalks, granite curbing and sidewalks, snow plowing and removal. We recycle all our demolition materials into ¾” process road base. This is an eco-friendly method cutting down on materials going to landfills. Why should I remove and replace my parking lot rather than pave over it? There are a number of reasons to remove and replace rather than overlaying a parking lot. The most common reason is a faulty base layer or pervasive water issues. However, at times an overlay is a good option for the client. 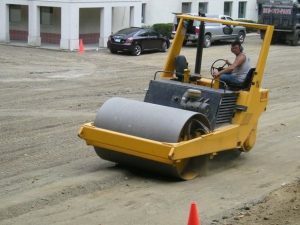 If the base layer is in tact we can simply pave over your existing asphalt surface. After 20 years in the Parking Lot Repair business we know what to look for. We’ll also ask the right questions so we make sure we offer the proper service for your situation. When a parking lot has multiple cracks and heaves it should be removed and replaced. Even if not completely heaved removal is usually a better option. Cracks will expand and contract under the new layer of asphalt and eventually reflect through the surface. Drainage is another important aspect to consider when overlaying. Sometimes the parking lot will need grading for proper drainage. In these cases it’s easier to remove the old asphalt to grade it properly. We also do plenty of overlays. In some instances budget and timing restrict what we can do. We will work with you to guide you in the right direction. It’s usually not hard to figure out the right way to go for you. How long should my parking lot last? The typical rule of thumb is that you’ll get up to 10 years out of an overlay and up to 20 years out of a complete replacement. That does not mean the parking lot will look perfect until its 20th birthday. Properly maintaining your parking lot along the way will extend its life. Please be aware of unscrupulous companies that work cheap and cut corners to be profitable. If the parking lot is installed correctly it will last.